ProForm Smart Strider 695 Elliptical Review by Industry Experts! 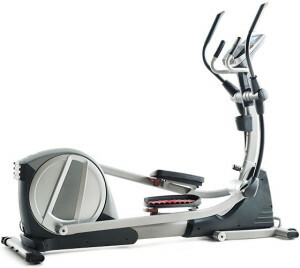 The ProForm Smart Strider 695 CSE Elliptical is ON SALE! The ProForm Smart Strider 695 is appealing because it utilizes patented features found on the more expensive commercial elliptical trainers. It incorporates a rear drive design, which many feel is superior to the front drive design. With a rear drive the elliptical path of the pedals create a ergonomically ideal stride that feels more natural and comfortable. When selling at the competitive $799 price this cross trainer is probable one of the best values for a budget elliptical. In addition to the ergonomic design it is packed with features. MID-WEEK SALE ENDS THURSDAY: The ProForm Smart Strider 695 is reduced to $749 with Free Shipping! An excellent value. No interest financing is available. Power Incline Adjustment — Like a treadmill you can incline the stride on the ProForm Smart Strider 735. The incline feature on your elliptical can be seriously addictive (in a good way!) It serves two purposes. First, it allows you to get a heart pounding cardio workout. Crank it up and you will be sweating bullets in no time. In addition, when you adjust the incline you are able to target different muscle groups, like glutes, quads and calves. On the other hand, with a fixed stride you are limited on what lower body muscles you tone. Smart Strider 695 CSE Console Display with iFit Live Programming. Integrated Tablet Holder – A tablet holder has been included so you can view iFit Live features and other entertainment while you workout. 18 Lbs. Flywheel — The weight of the ProForm Smart Strider 735 flywheel is heavy enough that you get a smooth elliptical motion. This is a HUGE improvement over the 13 lb flywheel found on the cheaper ProForm Smart Strider 495.
iFit Live — We could write a lengthy review just on iFit Live. In a nutshell, it’s the most innovative motivational technology found on an exercise equipment – period. It’s available for both ellipticals and treadmills. What it does is allow your elliptical to communicate with the Internet. There are primarily two features. First, you can go to iFit.com and create a personal account that defines your fitness goals like losing weight or toning up. iFit Live then downloads personal training programs geared towards your fitness goals. The program includes audio coaching from professional fitness trainers like Jillian Michaels. Your progress is tracked on your personal ifitlive.com account, so you can monitor your progress. In addition, you can map routes on Google Maps and the elliptical will simulate the incline by adjusting the resistance. There are slots on the console for a laptop, which then allows you to view your progress on Google Maps. We’ve used this feature and traveled down my local streets, viewing familiar sites in my neighborhood. There is an additional charge for iFit Live. The Smart Strider 695 CSE is listed as iFit “Coach Ready.” You will only need a smart device and a wireless internet connection in order to get going right away with the features from iFit Live. By the way…The older version of this machine (Smart Strider 735) was only iFit “Compatible” so it required the additional purchase of a WiFi module (about $99) in order to connect to iFit Live. Power Watts Display – The Smart Strider 695 has a Round Watts LED Display to show your power output in three distinct exercise zones. Easy Assembly — Often when you read customer reviews of ellipticals they discuss how complicated and time consuming the assembly was. ProForm has addressed this issue with the ProForm Smart Strider 735 and designed it so you can assemble it in 4 easy steps. Having assembled our share of fitness equipment, we can tell you this is a real bonus. Folding Mechanism — You can fold the ProForm Smart Strider 695 into an upright position thus freeing up space when not in use. Oversized, Cushioned & Adjustable Foot Pedals — Being oversized, you can better position your foot to your comfort zone. Being cushioned the pedal better absorbs impact. Being adjustable you can angle the pedal to reduce foot lift. 18″ Stride Length — A comfortable stride length for average height individual. Cooling Fan — This is a popular feature on elliptical trainers. The breeze won’t blow you away, but the advantage is that it’s targeted at your core. Speakers and MP3 Input — The sound system is average, but better than some ellipticals I’ve been on. Workout Programs — If you don’t want to opt for iFit Live there are 24 pre-installed workout programs that adjust the resistance and focus on different fitness goals. Warranty — You get Lifetime Frame, 2 years parts and 1 year labor, which is standard at this price range. Realize that $800 is not a lot for an elliptical and at this price range there are some compromises in comparison to more costly crosstrainers. However, ProForm is known for giving you the most for your money, which is evident with all the features on the ProForm Smart Strider 695 CSE. The patented design from Precor is one example of great quality for the buck. As we mentioned, we wouldn’t recommend these for aggressive exercising. We also believe the 300 lbs. user weight limit is extreme. we’d place the upper level at around 230 lbs. And the 18″ stride length would best serve individuals under 5’10”. 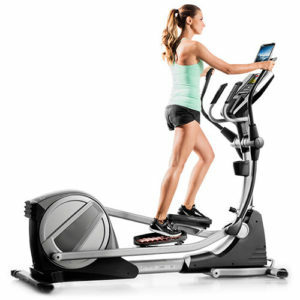 That said, for only $800 you’re getting a reasonably stable elliptical with power incline, and the most innovative technology in the industry, which makes the ProForm Smart Strider 695 CSE an exceptional value. ProForm Smart Strider 895 vs 695: Which Should You Buy? For around $200 more, you may also consider the ProForm Smart Strider 895. 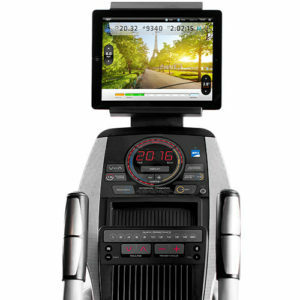 The main difference is that this other machine includes a 7″ Full Color Touchscreen instead of the round watts display. The Smart Strider 895 also has 32 total workout programs. Costco is selling preform 695 for $700. I can get a Schwinn 470 at $800 from Target. Which one will be your choice? I would recommend the Proform 695 as it’s a rear drive elliptical versus the front drive. Typically rear drive machines are found on more expensive commercial elliptical trainers.